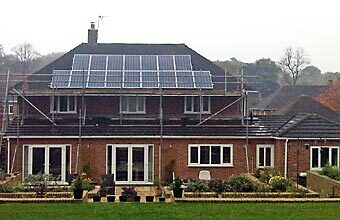 We installed a 4kWp Sharp solar array for Mr M in November 2011. A 4kWp system is the largest system allowed in order to qualify for the feed in tariff rate of 43.3p/kWh and is the system size that generally offers the best return on investment. Mr M will receive an approximate generation income from the government feed in tariff of £1,423.27 for the first year. He will also receive an approximate export tariff amount of £49.31. His savings from energy used will be approximately £230.09. All of this combined, Mr M is likely to receive a total income and savings for the first year of approximately £1702.67. This solar array consists of 16 x 250w Sharp panels and has been fitted to the rear of the property on the south west facing roof. These payments are guaranteed by the Government for 25 years, are tax free and adjusted in line with inflation over this time. Taking into consideration these factors this system is likely to receive payment totals over the next 25 years of £52,663. An installation of this kind is fully fitted and commissioned within 2 days. Our administration system enables our customers to have all paperwork in place and sent off within a few days from start to finish.